Hi, I’m Jackie and I take medication for depression, and I post on the internet about my bouts with depression and past suicidal thoughts. I do it because it’s important to talk about these things. Sure, it makes some people uncomfortable, but I don't do it for those people. I talk about depression and mental health for people like me who are chronically ill and are worried about stigma. Three out of four people with mental illness say they have experienced stigma. So what exactly is it? According to Webster's Dictionary, stigma is "a mark of disgrace associated with a particular circumstance, quality, or person." When we talk about the stigma surrounding mental health, we know that for hundreds, if not thousands of years, in countless cultures, people with mental disorders were locked away and forgotten — or worse. Fast forward to 2016. The stigma we deal with now is, in large part, due to a lack of education and understanding — which is bananas, because roughly 1 in 20 Americans experiences depression in their lifetime. Millions of people live with depression, but few people talk openly about it because everyone is embarrassed, and they’re embarrassed because so few people talk about it. 'Crazy'? Not so muchIn some ways, the stigma of mental illness is hardly surprising, especially when one considers that we are taught by popular culture society and even in popular movies or TV shows to scoff at mental illness is something we can scoff at. ** How many times have you heard someone use “crazy” as an insult to another person? ** What about, “You’re a psycho”? These phrases have become normalized, and while we don’t generally refer to people with mental disorders as crazy or psychotic anymore, the root problem is still there; crazy is bad, and people who are crazy are bad, and they should feel ashamed about how bad they are. But people with mental illnesses are not bad. They may feel bad, but it doesn’t mean they are inherently bad people. Let’s change that conversation to talk about the positive characteristics that so many people with mental illnesses have. 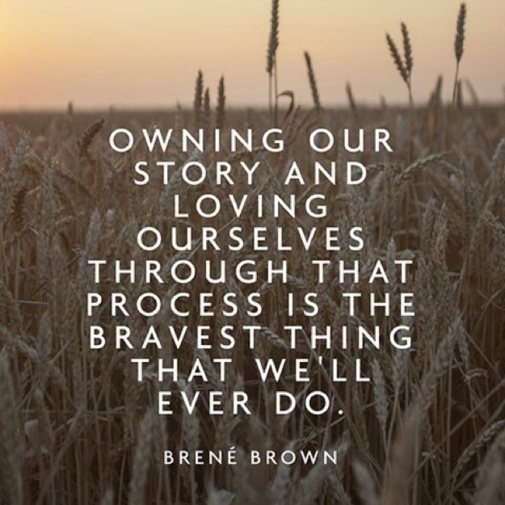 I encourage you to own your story, to share it, and to love yourself for your own courage along the way. Feeling like you’re alone in the world, or like no one understands you, can be incredibly isolating, and is often compounded by the fact that many patients isolate themselves when they’re feeling depressed. In my experience, people who struggle with their own mental health are usually deeply compassionate when they encounter someone who feels alone, or is self-isolating. They show compassion when it comes to illnesses or behaviors that they do not understand, and instead of questioning a circumstance, often just ask what they can do to help. As someone who has two chronic illnesses and long-term depression, I consider myself super-resilient. I don’t always bounce back quickly or gracefully, but I have learned that with time and effort I will always bounce back. Depression often tells us that we are not worthy of many things, including friends, happiness, love, and understanding. Resilience is listening to this message on repeat every day, but also continuing to make an effort to participate in life every day. October 10 is World Mental Health Day, a collective global effort to raise awareness and educate for mental health. It is estimated that 350 million people worldwide live with depression. That is 350 million chances to educate those around us. To destroy stigma. Each and every effort you make, whether small or large, can have a huge impact. Humanize those living with mental disorders, teach compassion, and be proud of who you are and the steps you take to help yourself. Every time I start to feel a little shame about my mental health and history, I remind myself that my medication and therapy appointments keep me happy and healthy. It may take a little more effort to keep me happy and healthy, but those extra steps make each day worth living. Jackie is an ulcerative colitis patient and the founder and Executive Director of Girls With Guts. Since diagnosis, she has been blogging her IBD journey at Blood, Poop, and Tears. Jackie has worked hard to become a strong voice in the patient advocacy community, and pays it forward as Social Ambassador of the IBDHealthCentral Facebook page.